Oh, man. I didn't get a wiener whistle either. I'll bet JOHN got a wiener whistle. John and I were sitting in our recliners reminiscing about stuff last night while we watched really terrible old movies. We were scrolling through the movie channel schedule. "Saw this.....don't like this one.....I remember going to see this one with my sisters when I was a little kid," mused John. Aw. Honestly - I didn't get to see movies in a theater until I was old enough to go on dates. You were such a lucky duck kid. And we never ever had pizza, either. I'll bet you guys got pizza when you were little too. "Yeah, well, Mom worked in a pizza place so she brought it home for us lots." He looked at me with some sympathy. We never got to have Oscar Mayer bologna that came out of those round yellow plastic containers, either. I wanted to bring bologna sandwiches to school SO BAD. "Well, hey Jul - I did take bologna sandwiches to school when I was a kid and I can tell you this was not a good thing." He got up from his chair and planted a big old smooch right on me. "Poor little girl never got spoiled. Can I buy you a pizza to spoil you? Or something else to spoil you? Anything but bologna." I should have smooched him back and asked for candy. But no - Julia can never quit blabbing especially when she's ahead. Seriously. When will I learn? I trailed off when I noticed John; whose expression had turned from sympathy to skepticism to outright exasperation. He plopped back into his recliner and told me that I didn't seem so deprived after all. Dang. Blew it big time. 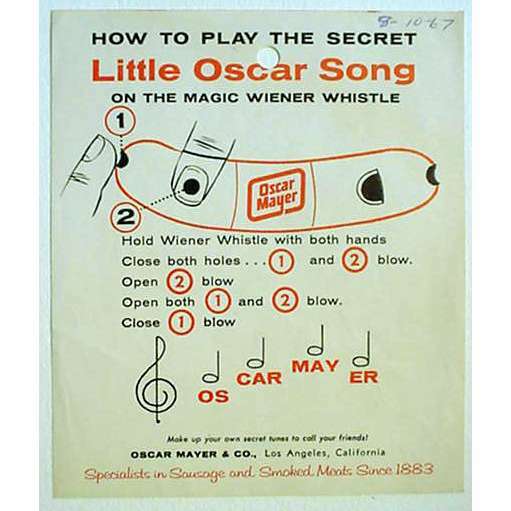 Did YOU get a wiener whistle?